Grab the nearest book you have lying around. Any book will do. Open it up to the copyright page, and you should see a fun little warning that tells you something to the effect of "All rights reserved. No part of this publication may be reproduced, stored in a retrieval system, or transmitted, in any form or by any means, without prior permission." What a nice piece of advice! Now, go to the Google Books website and search for that very book. If the one you chose happened to be one of the ten million that Google has scanned into their database, there's a good chance that you found your title. Even if no preview of this book is available, Google still provides a "snippet view", which allows the user to search for specific phrases from the text, all sheltered under the doctrine of fair use. More liberal publishing companies might have allowed Google to feature a few pages, or even entire chapters, as a "preview" that is viewable online. "But wait!" you exclaim. "Isn't that a violation of the copyright, specifically the part about not reproducing the text, transmitting it, or storing it in a retrieval system?" How does Google get away with this hat trick of transgressions? In the fall of 2005, the Authors Guild and the Association of American Publishers sued Google for just this reason, citing "massive copyright infringement". Even Google's claim that the Google Books project is nothing but a digital library catalog with an impressive search function doesn't hold water. It's true that Google allows full text view only for those works in the public domain, or for those which they gained permission. But the fact that the texts of millions of other books are stored in Google's servers is still a violation of copyright, even if these books are unavailable for public perusal. This case has been bandied about for the past five years, as Google has struggled to settle with the authors and publishers who initiated the lawsuit. At the same time, the issue has become more and more relevant. Not only has Google's book scanning continued unabated (currently they have scanned ten million books, compared to a scant total of one million in 2007), but other similar digital books projects have fallen by the wayside. Microsoft pulled the plug on Live Search Books in 2008, and any other similar projects lack Google's ambition and seemingly limitless funds. This means that if the Google Books project ever comes to fruition, it will be an effective monopoly. Google wants to make the case that it is providing all the services of a public library, but public libraries are supported by tax dollars and answerable to their citizens, whereas Google's control over such a database leads to questions of censorship or unfair promotion. Last October, a settlement was reached in the lawsuit between Google and the authors and publishers. The proposed settlement - which has yet to be made official - calls for Google to disperse money to victims of copyright infringement, and set up a copyright collective that is dedicated to finding the rightsholders of out-of-print books still under copyright protection, and dispersing payments to these authors or estates. Google would remain free of future litigation concerning copyright, and presumably Google and the authors and publishers of America would work together toward actually squeezing some sort of profit out of this massive digital library. So, does this mean that everything is hunky-dory, now that Google and the publishing industry have made up? Well, not exactly. For one, the settlement still presents several significant legal problems, including the question of monopoly; the courts still have yet to decide as to whether or not this proposed settlement will be legal. Additionally, a lot of rather significant authors are pissed off at the deal. Science-fiction author Ursula LeGuin resigned from the Author's Guild in protest. And there are other organizations besides the Authors Guild - genre-specific guilds like the SFWA and MWA, who argue that they were not contacted at all during the negotiations, and that the Authors Guild does not necessarily speak for all authors. The proposed settlement does give authors the ability to opt out; the list of thousands of names, from Thomas Pynchon to Michael Chabon to the sheet music publisher Boosey and Hawkes, indicates a substantial number of writers unhappy with the agreement. These authors have several legitimate worries. Questions of a digital monopoly aside, there is also the fact that the proposed settlement gives Google nearly a third of all revenue stemming from the sale of digital copies through Google Books. Standard publishing companies have always taken a cut, but these also help authors promote their materials and allow them to earn a living. What has Google done, the argument goes, to deserve a portion of an author's revenue, beyond illegally scanning the book in the first place? Such a quibble may seem rather petty now, but if there is a subscription service to Google Books in the future, Google stands to profit quite heavily when the old-fashioned publishing industry goes down the toilet. A third of all book revenues is not a bad profit for merely scanning a shitload of books at the right time. Not to mention those "orphan books", whose copyright holders are missing. While authors do have the opportunity to sell digital copies of their books elsewhere, Google has a de facto monopoly on books whose copyright holders are unaware of their renewed life; in this case, Google receives 100% of the revenue when no one steps forward to claim the rights. With no rightsholder present for these works, they will never be sold through a competitor's service. In effect, Google has become the sole owner of thousands of these orphan books, merely by gathering them up while no one was paying attention. Google, however, argues that they are providing a valuable service by digitizing these books, making them accessible to millions who might not otherwise have a chance to purchase the titles. 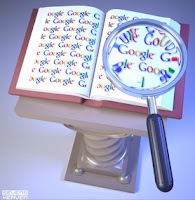 The term "out of print" would become anachronistic; according to Google's plans, all books under copyright could be sold online in perpetuity. Google makes the case that this allows for thousands of authors to sell books that might otherwise have languished in discontinued obscurity. There are arguments on both sides, of course. But what I find most fascinating about the entire issue is how forward-looking Google was in this endeavor. The company began scanning every book in the world in 2005, when things like the iPad and the Kindle were just distant dreams. Now, as e-readers become more and more relevant, and possibly stand to reform the entire publishing industry, Google's wish for a digital archive of every book in the universe doesn't seem so silly. No one wants to sit at their desk to read a Harry Potter novel, for example, but what if there was a portable device that allowed you to access Google Books? For a monthly subscription fee, you could access and read any book in the world through this device, and Google would make the appropriate payments to the rightsholders of the books that have been accessed. It would be like Netflix Streaming, only with literature. It sounds great for Joe Consumer, but perhaps the authors are right to be scared by this sort of deal. As the recent spat between Amazon.com and Macmillan Publishing shows, publishing companies and digital distributors might not always agree on what a fair price for a digital copy is. The lack of competitors means that, if the publishing industry continues its long decline, Google will be the sole corporate transmitter of literature. There are plenty of ethical questions about the nature of copyright, the flow of information, and the existence of literature as a solely digital phenomena, that I don't have time to get into here. But it's worth considering what the world of books would be like if it were remade in Google's own image. There are pros and cons, and no easy answers.